Of all the wacky/injury-based batting order machinations, Yunel Escobar leadoff delights me to no end. I liked the way Escobar draws the odd walk and he seems to be closer to the 3/4 Win stud the Jays thought they were stealing from the Braves. One nagging legacy of my time in the baseball dark ages is my personal unease when I see somebody swing at the first pitch. Mostly because I'm become so pro-walk (probably to a fault) and it stands to reason that nobody ever walked on the first pitch. Thankfully, I'm an idiot. 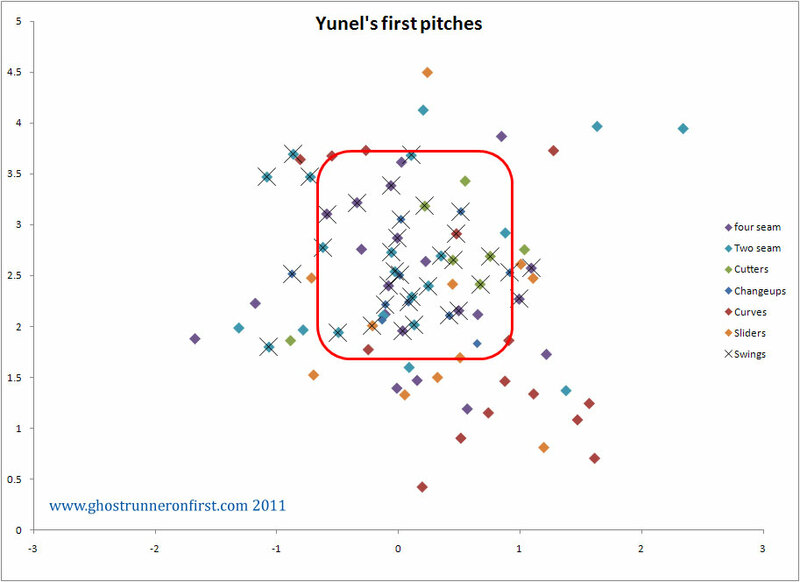 Hitters rake on the first pitch and Yunel is no different. His OPS rises high above 1.000 on first pitches this year and he has 9 first pitch home runs in his career. The concern, as always, is pitchers taking advantage of this aggression and throwing him junk out of the zone in an attempt to get way ahead. Let's take a look to see if this is the case in 2011. Other than a few two-seamers/sinkers tailing in on his hands, that is pretty impressive discipline from Escobar. He certainly doesn't expand the zone in an appreciable way. The even better news is Escobar takes the first pitch nearly 60% percent of the time. Again, refusing to expand the zone and waiting for a good pitch to hit. Of his 9 first pitch-hits, he has three on changeups, three on fastballs, and one each on the slider and the curve. What does this mean? I'm okay with Escobar swinging away on the first pitch. He is a smart enough hitter to wait for a good pitch to whack and whack it he does. If only I could say the same about half the other Punch & Judy's currently populating the lineup. "He gets out there with his big, strong physique and intimidates the pitcher early. And the pitcher knows that if he makes a mistake that Escobar is strong enough to really make him pay for it. He knows how to be agressive, but agressive in the zone." I as well have been pleasantly impressed with Yunel hitting leadoff. Question: With Rajai's return coming any day now, where do you slot him in the lineup? You have to keep Yunel hitting leadoff no? The dirty little secret about everybody's favorite player Rajai Davis: he can't really hit. I'd slot him ninth with Escobar still leading off. Other than the first inning (and the additional at bats) everything else Farrell wants to do still works with Davis 9th. I love it when a right-handed batter goes up looking fastball away on the first pitch and lines it into right field. paging Aaron Hill, paging Aaron Hill.